This page describes the Carboniferous Period, including stratigraphy, paleogeography, and famous lagerstätten, followed by a sketched outline of some of the major evolutionary events. The Carboniferous was the first system to receive a name that is still in official use today. The name was applied to coal-bearing rocks in England and Wales by William Conybeare and William Phillips in 1822. Subdivisions of the Carboniferous have varied over time and between regions: In eastern Europe and Asia, Lower, Middle and Upper divisions were commonly used; in western Europe, just Lower and Upper; and, in North America, “Carboniferous” was typically not used at all, being replaced with Mississippian (lower) and Pennsylvanian (upper) Systems instead. The current international convention is to recognise the Carboniferous System (Period) as being divided into Mississippian and Pennsylvanian Series (Epochs). The GSSP defining the the base of the Carboniferous (i.e., the Devonian-Carboniferous Boundary) was established in 1991 (Paproth et al. 1991) at La Serre, France, where it is set at the first appearance datum (FAD) of the conodont Siphonodella sulcata. Subsequent research, however, has revealed stratigraphic problems with this datum, and it is now relised that this horizon cannot be correlated with precision at present. The GSSP is at the base of Bed 89 in Trench E at La Serre. The La Serre section is located in the southeastern Montagne Noire, Departement Hérault, District of Cabrières, in southern France. Artificial trench E, which averages 80cm in depth on the southern slope of La Serre Hill, is about 125m south of the hilltop (252m), about 525m east of La Roquette farmhouse, 2.5km northeast of the village of Fontès (sheet 1:25,000 Pézenas XXVI/44, 1-2, x = 682.55, y = 140.12). Sedimentology: The rocks in trench E’ are part of a geologic unit named “Klippen of Cabrières”. The youngest Devonian and earliest Carboniferous beds are characterized by a sequence of predominantly biodetrital oolitic limestone within a pelagic matrix of shale and cephalopod bearing calcilutites. Primary Markers: First appearance of the conodont Siphonodella sulcata within the evolutionary lineage from Siphonodella praesulcata to Siphonodella sulcata at the base of Bed 89 in trench E’. Secondary Markers: The trilobites Belgibole abruptirhachis, Archegonus (Phillibole) and Carbonocoryphe also occur in Bed 89. Some of these other taxa are especially important at other Locations around the world. For example, Belgibole abruptirhachis occurs immediately above the Hangenberg Schiefer interval in various cephalopod-bearing sections from the Renish Slate Mountains (Germany), the Holy Cross Mountains (Poland) and the Carnic Alps (Austria). See Paproth et al. 1991. The GSSP defining the the base of the Permian (i.e., the Carboniferous-Permian Boundary) was established in 1998 (Davydov et al. 1998) at Aidaralash Creek, Kazakhstan, at the first appearance of the “isolated-nodular” morphotype of the conodont Streptognathodus “wabaunsensis”. Current age calibrations place the base of the Carboniferous and Mississippian at 358.9 ±0.4 Ma, the base of the Pennsylvanian at 323.2 ±0.4 Ma, and the base of the Permian (i.e., the top of the Carboniferous and Pennsylvanian) at 298.9 ±0.15 Ma (Cohen et al. 2015). Thus the Mississippian is approximately 36 my in duration, the Pennsylvanian approximately 24 my, and the whole Carboniferous Period approximately 60 my. Major episodes of mountain building were associated with the assembly of Pangea. Both the Appalachians and the precursor ranges of the Rocky Mountains in North America began forming at this time. At the beginning of the Carboniferous Period, the supercontinent of Pangea was forming from the collision of Laurentia (North america and Europe) and northern Gondwana. 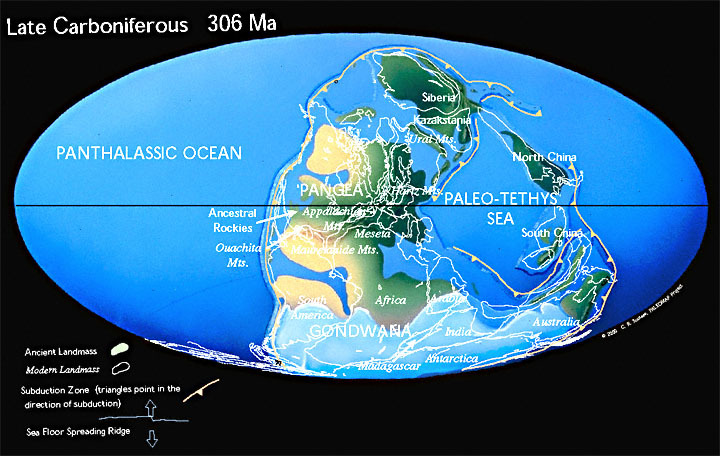 “Before the collision, Gondwana had rotated clockwise, so that the its eastern part (India, Australia, and Antarctica) moved south while its western part (South America and Africa) moved north. This rotation opened a new ocean, the Tethys Ocean, in the east and closed an old one, the Rheic, in the west” (Palmer 1999, p. 26). The assembly of Pangea concentrated almost the entire landmass of the Earth into one hemisphere; the Panthallassic Ocean occupied almost the entire opposite hemisphere. In general, sea levels rose through the early part of the Carboniferous, receding again in the later part. Paleogeographic reconstruction for the Carboniferous from Christopher Scotese’s excellent ‘Paleomap Project’. The global climate cooled from the humid, hothouse conditions of the preceding Devonian Period. By the mid-Carboniferous it had become markedly seasonal and polar icecaps were forming. By the end of the period, aridity had increased and glaciation had become extensive. Atmospheric oxygen increased to perhaps 35% towards the end of the Period. Carbon dioxide levels were also high by today’s standards. The seas were dominated by sharks and bony (teleost) fishes. On land, arthropods became very large, and tetrapods diversified. Loch Humphrey Burn: Early Carboniferous Loch Humphrey Burn Southern Scotland; an exceptionally well-preserved Lower Carboniferous terrestrial ecosystem, containing several successive plant bearing horizons within a volcanic terrain. Carboniferous rocks are almost unknown in New Zealand. Only four isolated conodont faunas having been reported (Campbell in Cooper 2004, p. 61), accompanied in one case by rare fish scales (Jenkins & Jenkins 1971). Briggs, D.E.G. ; Clark, N.D.L. ; Clarkson, E.N.K. 1991: The Granton shrimp-bed, Edinburgh – a Lower Carboniferous Konservat-Lagerstätte. Transactions of the Royal Society of Edinburgh, Earth Sciences 82: 65-86. Briggs, D.E.G. ; Clarkson, E.N.K. 1983: The Lower Carboniferous Granton ‘Shrimp-Bed’ Edinburgh. Special Papers in Palaeontology 30: 161-177. — 1985: The Lower Carboniferous Shrimp Tealliocaris from Gullane, East Lothian, Scotland. Transactions of the Royal Society of Edinburgh, Earth Sciences 76: 173-201. Conybeare,W.D. ; Phillips,W. 1822: Outlines of the geology of England and Wales, with an introduction compendium of the general principles of that science, and comparative views of the structure of foreign countries. Part 1. William Phillips, London: 1-563. Davydov, V.I. ; Glenister, B.F.; Spinosa, C.; Ritter, S.M. ; Chernykh, V.V. ; Wardlaw, B.R. ; Snyder, W.S. 1998: Proposal of Aidaralash as Global Stratotype Section and Point (GSSP) for base of the Permian System. Episodes 21 (1): 11-18. Grey, M.; Finkel, Z.V. 2011: The Joggins Fossil Cliffs UNESCO World Heritage site: a review of recent research. Atlantic Geology 47: 185-200. Jenkins, D.G. ; Jenkins, B.H. 1971: First diagnostic Carboniferous fossils from New Zealand. Nature 233: 117-118. Paproth, E., Feist, R., and Flaijs, G. 1991: Decision on the Devonian-Carboniferous boundary stratotype. Episodes 14 (4): 331-336. Rolfe, W.D.I. 1988: Early life on land; the East Kirkton discoveries. Earth Science Conservation 25: 22-28. Rolfe, W.D.I. ; Durant, G.P. ; Baird, W.J. ; et al. 1994: The East Kirkton Limestone, Viséan, West Lothian, Scotland: an introduction and stratigraphy. Transactions of the Royal Society of Edinburgh, Earth Sciences 84: 177-188.